Andrea Negrete and Rachel B. Joyce in Let's Get Ready Together. Photo by Ashley Garrett. BOTTOM LINE: The first months of college life bring friendship, conflict, and heartbreak into the lives of three very different young women. 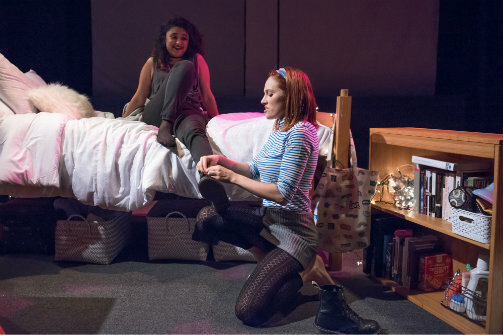 In Let’s Get Ready Together, a funny and touching but messy new play by Lizzie Stern, three girls previously separated by class and geography are brought together as neighbors in a college dorm. Nina (Marieta Carrero) is from California and plans to become a doctor; Ella (Rachel B. Joyce) hails from Illinois and hopes to join the campus improv group; and New Yorker Clara (Arielle Goldman) just wants to figure out how to attend parties without having a panic attack. The play follows their intense first weeks at an elite New England school where the ghosts of the past will inevitably come back to haunt them. Director Lily Riopelle does an able job, keeping her all-female cast moving smoothly through the play’s twists and turns and the Tank’s cramped playing space. Initially, we’re in familiar territory: three girls are excited to be on their own but anxious about being away from home. They bond quickly, share details of their sexual experience (or lack thereof) and have awkward phone conversations with their loving mothers (all of whom have made sure their daughters have condoms handy, just in case). But their freshman year idyll turns nasty when racist graffiti appears on campus: Nina, who is Latina, is angry and terrified, and her new besties aren’t sure how to help her. Let’s Get Ready Together is most successful as a portrait of 21st-century college life, where young people find themselves forming deep friendships despite dissimilar backgrounds, and Stern’s dialogue skillfully combines the naturalistic and the comedic. But even at a trim 90 minutes, the play meanders, as if paralleling the uncertainty of its central characters. Happily, it’s full of great performances; the whole cast is solid, but especially good are Goldman as the nervous Clara and Dawn McGee as Ella’s needy mom. Like its three young subjects, Let’s Get Ready Together is lovable and smart, despite not quite knowing where it’s headed. Let's Get Ready Together is by Lizzie Stern. Directed by Lily Riopelle. Produced by the Tank and Maya Davis & Erin Mizer Helton. Scenic Design is by Cate McCrae. Costume Design is by Nicole Slaven. Lighting Design is by Cha See. Sound Design is by Valentine Monfeuga. Stage Manager is Hanako Rodriguez. The cast is Ruth Aguilar, Shauna Bloom, Marieta Carrero, Arielle Goldman, Rachel B. Joyce, Dawn McGee and Andrea Negrete.